Visual China Group (VCG), one of China's top image providers, recently drew intense criticism after it was revealed to be earning money by selling images of China's national flag, national emblem, and the first-ever picture of a black hole, which are supposed to be public domain images. VCG quickly removed the images, clarifying that they never owned the copyright to the pictures but only had permission to sell the black hole photo. The company later triggered further controversy when it was found to have acquired potential customers through searching for infringing images they had used and claiming large amounts of compensation. The paper.cn reported on Sunday that VCG and its subsidiaries filed more than 2,000 lawsuits alleging copyright violations in 2017 and 2018. The number of related litigation documents reached 11,023. Among such cases, VCG demanded infringement compensation from a company for 10,000 yuan ($1,491) per photo, which it said would be cut to 300 yuan if the company agreed to seek cooperation on the use of photos, the report said, citing an unidentified person familiar with the matter. The official website of the company was temporarily closed after the local Internet Network Information Center ordered it to make a complete rectification on Thursday. The National Copyright Administration of China (NCAC) said that it attaches great importance to image copyright protection, emphasizing that all picture companies should improve and standardize copyright management and not abuse their legal rights. The NCAC will include image copyright protection in the upcoming "Sword Net 2019" special campaign which aims to further standardize the industry. The incident was the first hot online debate on image copyright protection in China since the advent of the we-media era. The discussion took the internet by storm and focused on the relationship between picture provider platforms, photographers and image users, and also on the current poor situation of domestic picture copyright protection. Despite its many supervision loopholes, many acknowledge VCG's role in image copyright protection, as it has contributed to protecting the legitimate interests of photographers through its crackdown on photo piracy. Some argue on social media that blindly condemning the platforms may result in a backlash that could make copyright holders more vulnerable and result in higher user costs. The China Academy of Information and Communications Technology (CAICT)'s annual report on China's network copyright protection in 2017 shows that 26 percent of internet copyright infringement lawsuits in China that year involved photo and image copyrights, ranking second after text copyright infringement. Liu Wanming, a freelance photographer, told the Beijing News that hundreds of his photos were found to have been used without his authorization by various agencies, including government departments, SOEs, companies and TV stations. Liu said that the copyright market in China is currently in a state of confusion. "Not many advertising and media companies proactively pay for copyright from photo providers, while other companies tend to buy cheap pirated photos from e-commerce platforms, or simply download them from the internet without authorization," said Liu. The Beijing News revealed on Friday that as many as 80,000 background pictures are sold at just 3.5 yuan ($0.50) on one online second-hand goods trading platform. The report said it is mostly advertising companies and private media that buy these pirated photos. Li Tao (pseudonym), a photographer with 14 years of working experience, told the Global Times that being infringed is a problem that affects almost every domestic photographer. "People do not regard photography as a profession that deserves respect. 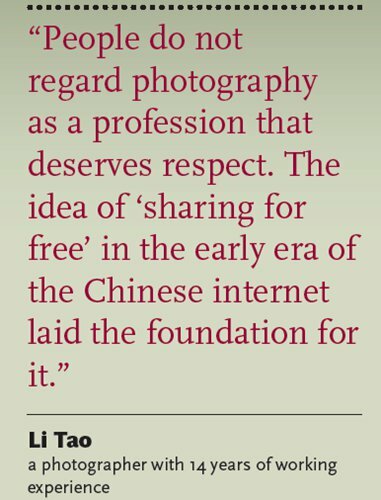 The idea of 'sharing for free' in the early era of the Chinese internet laid the foundation for it," Li told the Global Times. But even if the platform made a claim on these infringing pictures, the photographer would have no idea about the status of the charge, let alone have any share of the compensation. "Also, no one cares about whether the photographer wants to sell the picture or not, particularly to a certain media outlet they may dislike. Our rights can never be really respected," said Li. 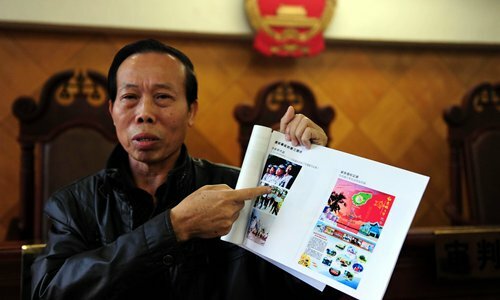 A Beijing-based veteran photojournalist told the Global Times that even photo-selling platforms that claim to be fully committed to protecting photographers' rights are committing copyright infringement against them. A close-up photo of former US President Bill Clinton that the photojournalist took in 2008 was later found to be on sale on the VCG website, without his permission. The photo, which was widely circulated and used as the cover of a book, eventually earned him only 160 yuan in compensation. Li believes that Chinese media is still at a very embryonic stage in terms of image copyright protection compared to the West. "The Western media has a professional and standard treatment for the image copyright issue going back a decade," he said, "If they want any photo, they will try all possible ways to find the photographer and ask for a purchase." A report released by consulting institute zhiyan.org on the business prospects and investment credibility of image copyrights in China for 2018 to 2024 shows that demand for photo agencies in China has been on the rise in recent years due to the booming we-media industry. In a bid to bring in more viewers through more attractive content, we-media emerged in 2012 bringing about an explosion in demand for images and photos. The report shows that in 2019, China's image and photo industry will see a market size of 20.7 billion yuan. The booming industry has pushed up image prices, but also brought more copyright infringement. Many social media platform editors told the Global Times that they believe "images found on the search engine Baidu can be used directly." Baidu, China's main search engine, currently has no restrictions on the downloading of photos. Global Times found that most social media platforms and some well-established traditional media do not clearly identify the author and source of the pictures they use, only stating that the pictures "come from the internet." Chai Jijun, VCG founder, previously told bianews.com that the unauthorized use of pictures was a very serious problem among social media, and few outlets take the initiative to request reasonable authorization from picture-sharing platforms, adding that there are still large loopholes in regulating the use of new media images. The lack of consequences for infringement and low awareness of copyright regulations make the tracking of piracy a tricky job. However, artificial intelligence technology can be a big help in tracing the source of infringements. In 2015, quanjing.com, another photo provider in China, started to develop AI image recognition technology at the same time as establishing its image gallery. Lü Chen, CEO and founder of quanjing.com, told Caijing, a Chinese business magazine, that the source of a pirated image can be determined by running the title of a WeChat official account or related webpage link in the system. In addition, blockchain technology can assist with copyright registration and supervision. However, the AI technology is still in the preliminary development stage, and for AI technology developers, application and commercialization of the technology presents another bottleneck. "The essential problem lies in the low cost of infringement and high cost of safeguarding legal rights," Li told the Global Times. "Very few photographers will charge for a picture. Most settle the matter by leaving it unsettled, like me." But he stresses that VCG has provided a way for photographers to make a profit. He said it would be even harder for an individual photographer to claim his rights in an infringement case if he does not work together with any platform. Lian Chenghe, a lawyer from King & Wood Mallesons, told the Xinhua News Agency that intellectual property rights (IPR) protection still needs to be promoted and supervised by the relevant agencies. It is essential that administrative organs carry out law enforcement or administrative activities under the framework of the Copyright Law. Doubts over VCG's business model should not result in the collapse of the hard-won social consensus on the protection of intellectual property rights. The heated discussion shows that people are paying more attention to the domestic protection of intellectual property rights. "Copyright licensing may not always mean financial gain. What is more important is enforcement procedures and making rules than results. 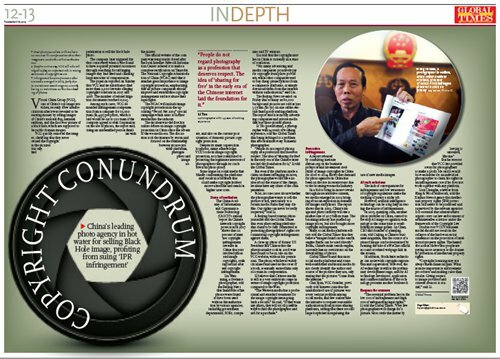 Giving respect to image providers and content creators is crucial," said Li.